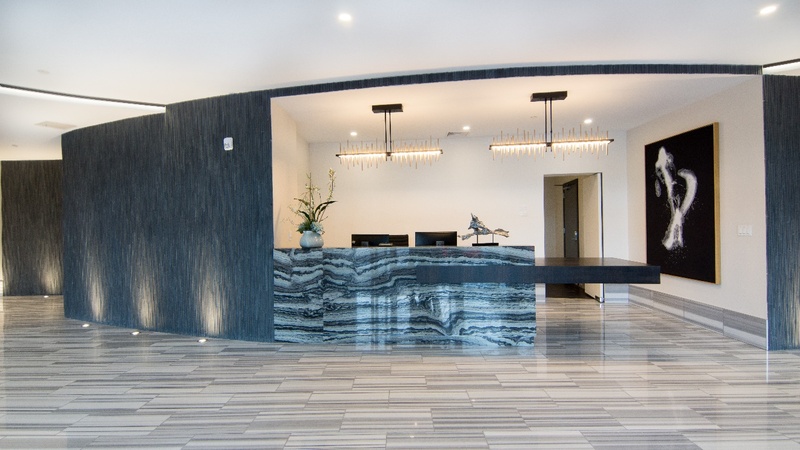 Creating the right vibe inside your new building will often set the tone for new prospects and visitors who come shopping in the hope of finding their dream home, condo or luxury apartment. Generating fabulous interior spaces often becomes the responsibility of the interior designer, the architect, or the developer’s selections. Flooring products that wear well and look amazing is a balance and involves careful planning for areas like lobbies, common spaces, fitness areas, recreation or community rooms, and most importantly the interior of the residence itself. With new products constantly being introduced into the marketplace, it is important not to lose sight of the importance of a floor’s performance and the traffic patterns associated with the space. Here are some important things to consider about the most common flooring options available today. Wall-to-wall carpet has been one of the most common flooring options for the past century. Many of the materials have been upgraded over time, and the newest trends include carpet tile. 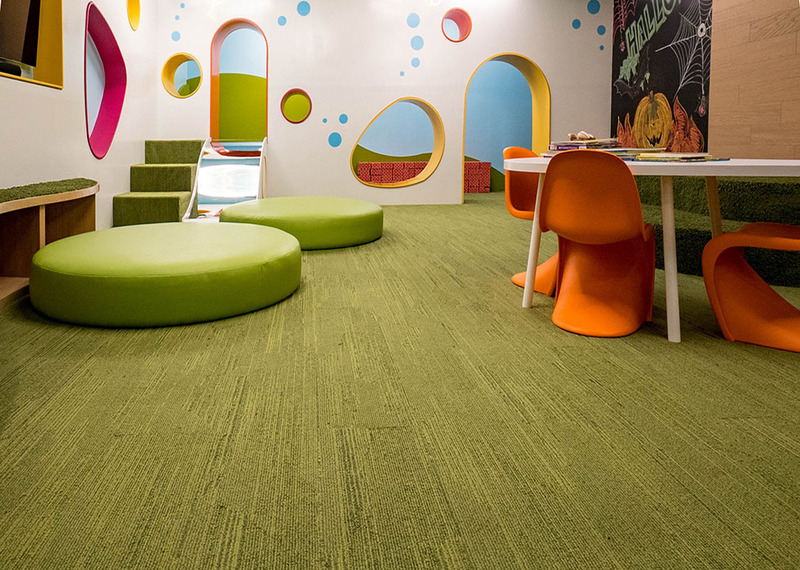 Carpet tile is popular in amenity spaces and common spaces throughout a building, as well as commercial applications like schools and libraries. For a stunning look and feel, be sure to select a carpet tile that has a multi-dimensional pattern and design. A multi-colored carpet will also help hide dirt and wear. Manufacturers now offer carpet that can look like other surfaces, like concrete or stone for instance. Today’s tile choices are virtually endless! With a wide range of colors, shapes, sizes and materials to select from, today’s tile has one factor that is undeniable: it is incredibly durable when installed properly. The most important aspect of wall and floor tile is the installation. Making sure the walls and floors are perfectly smooth and using the right tools for your installation can make all the difference. Always hire professionally skilled and trained installation crews to level the floors; this is crucial to the longevity of the floors, no matter what type of flooring you choose. 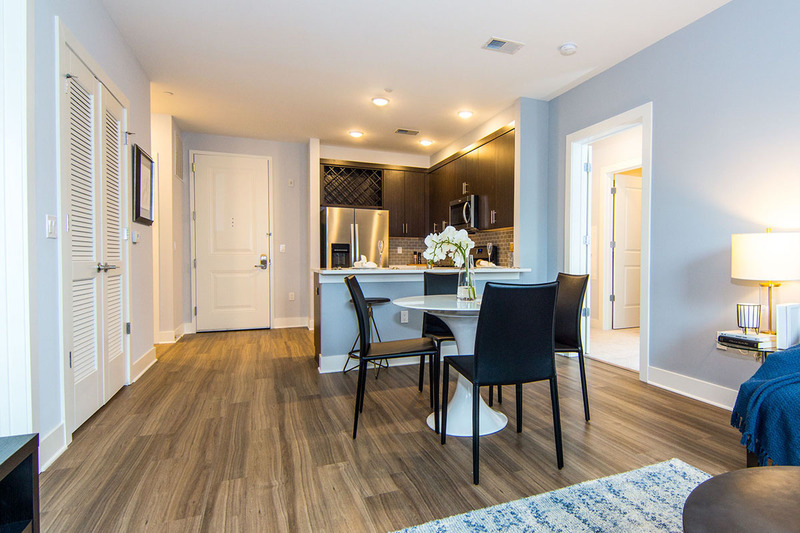 Hardwood flooring speaks of “timeless quality.” The architect and design team were searching for the perfect floor and Direct Flooring delivered. 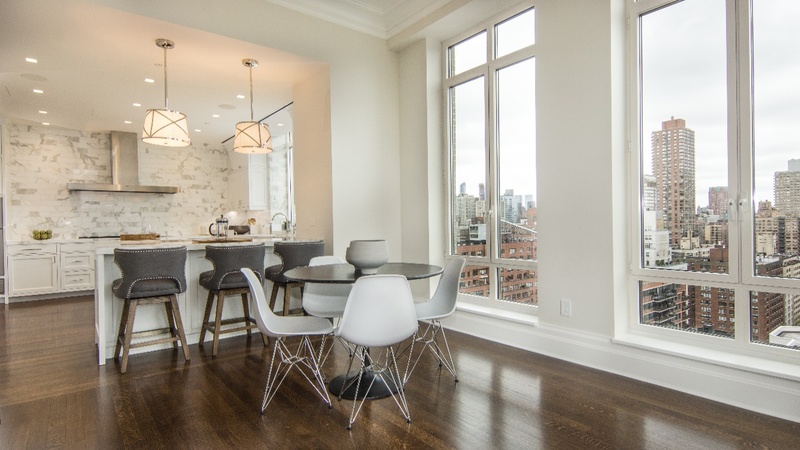 Luxury mid-rise Penthouse located at 20 East End Ave, New York, NY. Engineered hardwood flooring has been proven to be more stable over time. Solid and engineered floors can both be sanded and re-finished to make them look new or to change the color, shade, tone, and finish. To learn more about hardwood floors being properly acclimated before, during, and after installation, click here! With attractive tiles, planks and glue-free sheet goods, vinyl (resilient flooring) is also an affordable solution that looks and wears great. New luxury vinyl floors can look like tile, stone, or wood and comes in a variety of widths and lengths. You can use it anywhere you are expecting high traffic. Luxury vinyl is good for commercial applications and is easy to clean and maintain. All residences at One William Street, Englewood enjoy luxury vinyl which simulates hardwood flooring. Project by Direct Flooring, Flemington, NJ. Luxury vinyl is also water-resistant, making it a perfect match for basements and places that get damp. Unlike many other types of non-carpet flooring options, however, vinyl can be soft, so if you’re putting it in an area like a dining room or kitchen, you’ll have to take care not to gouge or mark it when you’re moving chairs under the table. Overall, vinyl provides a good long, useful life provided you give it the care it needs. Let Direct Flooring guide you to success on your next flooring project! Now that you have a taste of flooring options and possibilities, it’s time to get some insights from the experts. Direct Flooring has been guiding architects, designers, and developers on flooring trends and new products for over a decade. Price, quality of product and installation practices and procedures are just a few reasons our business continues to grow. Direct Flooring provides flooring of all types and is located in Flemington, NJ. We service all areas of NJ, New York City metro areas and Eastern, PA. For our expert customer service, call (877) 339-1009 or email our sales team at sales@dfemail.com.